The first week of summer break is in the books, and it went pretty well, especially considering I'm not really on break. Gareth was signed up for a PE camp at his school, which was awesome. I remember liking PE in Elementary school, but not doing the awesome stuff they do here. I don't know if it's a Washington thing, or if we've had a nationwide spike in PE teachers who are actually excited about PE, or what. But they do all the usual sports plus archery and roller skating and biking. For the biking unit, the PE teacher turns the blacktop into an impromptu traffic garden in order to teach the kids the rules of the road. There are a couple of permanent traffic gardens in Seattle, but chalk and cones works decently for a schoolyard setting (though how awesome would it be to have permanent ones??). Anyway, PE camp was basically a mini version of the year. They got to play a variety of games the first day, skating the next, then archery, then biking. Gareth had a great time. Midway through the week I needed to go up to campus to get some work done. So when I picked Gareth up from camp, we hopped on the bus to campus. I figured we'd make an afternoon of it, since he'd wanted to see more of campus when his class was there for a fieldtrip back in the winter. 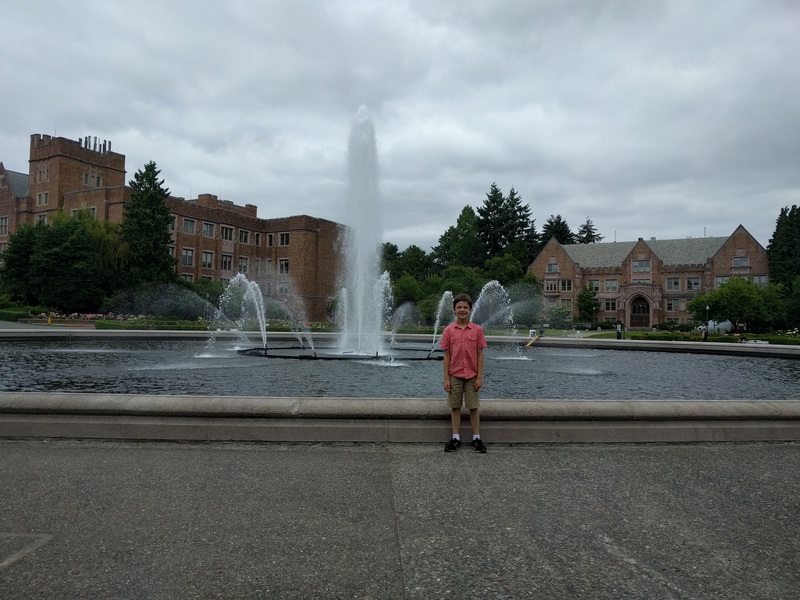 Took him to the HUB for some lunch, then showed him my building on the Quad and the cherry trees (we'll have to come back when they're in bloom sometime), then we headed to Suzzallo Library, which he'd been eager to see. He was duly impressed by the reading room and then we explored a little further into the more typical part of the library. He was in awe of the number of books all in one place. 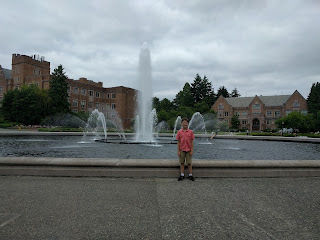 Then we started to head toward the Drumheller Fountain, but made a quick stop at Mary Gates Hall, where he realized that as gorgeous as they are on the outside, most of the other buildings just have offices and classrooms inside, so aren't quite as exciting to tour as the library. On to the fountain we went, where we sat on a bench to rest our legs and enjoy the fountain for a bit before heading home. The boys also saw the "brushing teeth doctor" this week, which Mal had declared to be his favorite doctor, largely due to the fact that you get a prize when you're done. He was much more excited about the visit this time and thought the ride as the chair reclined was very cool. 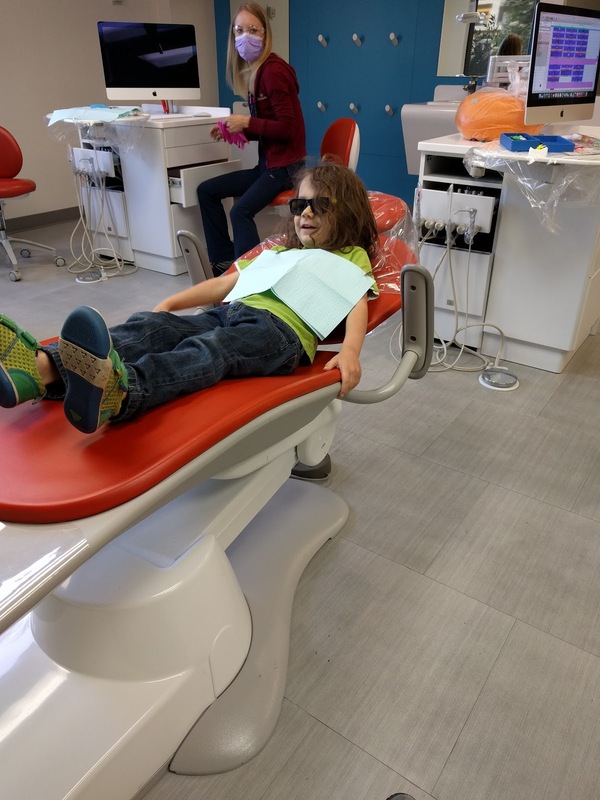 He did end up crying when they were spraying water into his mouth to rinse out the toothpaste, but the dentist calmed him down by showing him photos of his family's camping trip from the previous weekend. Gareth was declared to have done a much better job brushing around his braces this time than he had the previous time. We have an orthodontist appointment this next week where we might find out when he'll get the braces off. The childcare center has all sorts of activities planned for the kids through summer. One day this week, Mal got to experience a visit from The Parrot Lady, after which he was in tears because he wanted to buy all the parrots. I told him he can buy whatever he wants when he's older (and that parrots need a lot of space to fly around in - don't know if it's true, but we'll say it is). He's not old enough to go on off-site field trips, so when the big kids went to the zoo, he got to play zoo with stuffed animals and had a great time. Every Friday is splash day, where they turn on the sprinklers and let the kids run through them. I wasn't thinking Mal would enjoy this much since he refuses to run in the sprinkler here at home, but apparently he loved it. Not sure he actually ran through the sprinkler, but at least he enjoyed himself. And then we stuck around for the center summer potluck at the end of the day, which both boys had a great time at. All the younger school-age kids have been missing Gareth this week (he gets swarmed by kids when he returns after being out for a day or two), so some of them enjoyed getting to hang out with him at the potluck. Hopefully the rest of the summer goes so smoothly!